1/2" x 10' New England HighVee Wire-Core Flipline With A Swivel Double Locking Steel Snap. This flipline starts with New England Ropes 1/2" HiVee Climbing line where the nylon inner core is replaced with a cut resistant wire-core. The 5M test forged steel swivel snaps are swaged eye terminated at one end and the tail end is terminated with an eye and thimble. 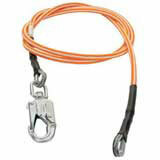 Swivel snaps are recomended when mechanical rope grabs will be used for length adjustment.